The worst tech gift I ever received — The Ren & Stimpy Show: Veediots! As a lifelong gamer, it goes without saying that I've gotten a lot of video games as Christmas presents over the years. I've stopped asking for them because people don't have fun buying them for me, and there are simply too many out there to be sure you're buying the right thing for that beloved relative. When you were a kid in the pre-Internet days though, you didn't get the chance to request certain presents with proper research. A screenshot in a catalog, a recognizable TV show, a brief session of play at a friend's house, recess word of mouth. You took what you can get, and sometimes, you got games you didn't expect! I've gotten some great video games under my Christmas tree over the years, and I've gotten more than a fair share of terrible ones as well. I was going to write a piece about how SaGa Frontier is both the best and worst game I've ever received for Christmas, but I already talk too much about my complicated relationship with that game. 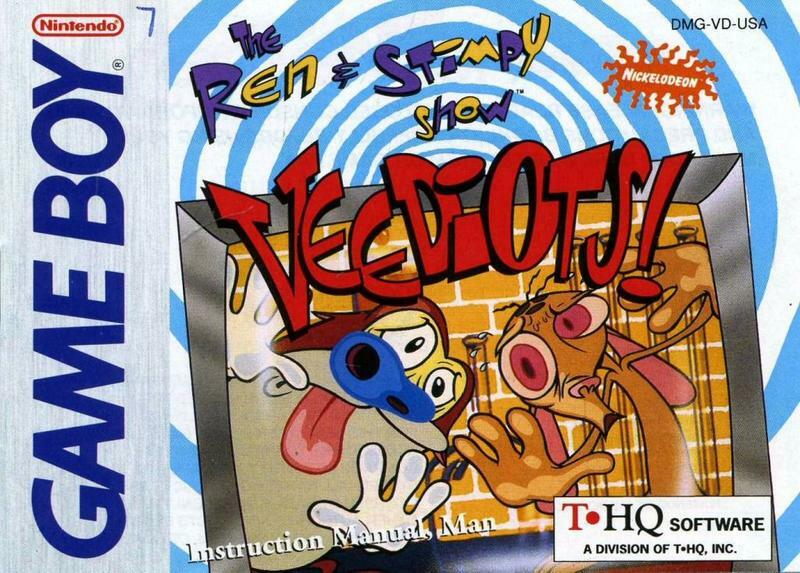 Instead, I'll be focusing on a horrid puddle of bile that is the outright worst piece of garbage that ever wound up under a Christmas tree with my name on it: The Ren & Stimpy Show: Veediots!… for the Game Boy. Like most video game consoles when I was a child, I didn't get a Game Boy until a few years into the handheld's life-cycle. It was Christmas morning on 1993, and I was still living way out in the mountains of Wyoming. I can't remember why, but I really wanted a Game Boy more than anything else, and my parents' acquiesced. Probably all of those long car rides across the barren Wyoming landscape to Yellowstone or Mt. Rushmore inspired my bored and hyper-active childish brain. Not coincidentally, 1994 became the year we discovered my chronic motion sickness. This was also the year I found out there was no Santa, so I think they felt they owed me big. I remember a friend and I were obsessed with The Legend of Zelda: Link's Awakening, probably because we really wanted A Link to the Past but weren't bold enough to request a Super Nintendo, and we both woke up with our wish that morning. I put over 270 deaths into my first playthrough of Link's Awakening, and it's still one of my favorite Zelda games to go back to to date. Not a bad way to start my life of portable gaming with one of the greatest portable games of all time. However, you can't have just one Game Boy game, can you? My obsession with Link's Awakening might have proved otherwise, but my parents also chipped in for The Ren & Stimpy Show: Veediots! because they knew I liked the TV show. Now, certain Game Boy games have aged very well. There is a very complicated art to making a game that can stand the test of time with such limited technology, but it is possible. Nintendo was able to do this over and over again, but most company's used the Game Boy to make a quick buck using popular cartoon licenses. Because of this, the Game Boy library is littered with plenty of throwaway 2D licensed platformers that aren't worth the salt on your boots on an icy morning. To its credit, The Ren & Stimpy Show: Veediots! is a bit more complicated than the average throwaway platformer. Each stage has its own unique mechanics, like telephones and fans in the first stage and the item collection in the second stage, but neither is smart enough to offset the repetitive level design, raunchy framerate, floaty jump physics, and brutal difficulty. Neither Ren nor Stimpy is able to fight back against the countless obstacles that try to get in their way and are only able to awkwardly jump out of the way. Fine for some games, but not ones that have a barely functioning set of rules. If I had anything positive to say about The Ren & Stimpy Show: Veediots! it's that I enjoy the Game Boy's rendition of Log, one of the cartoon's best original songs. It's also not the worst 2D licensed platformer that would wind up in my Game Boy collection. My third Game Boy game turned out to be The Pagemaster, much more competent but hardly masterpiece, and I also bought The Amazing Spider-Man at a Boy Scout sponsored yard sale. That is the worst Game Boy game I ever owned, and it would be a while until I got a "quality" second game, Super Mario Land 2: 6 Golden Coins. What's the lesson in all of this? Well, we should be thanking Nintendo for making such a timeless masterpiece like Link's Awakening because if it hadn't been for that game, then I would probably be writing about the Game Boy as my worst tech present right now.